2018 Fox Island Garage Sale - This Saturday, Sept. 8th! It’s here again! It’s a unique kind of “treasure hunt”: the 2018 Annual Fox Island Garage Sale is THIS SATURDAY, September 8th, from 9:00am to 3:00pm. 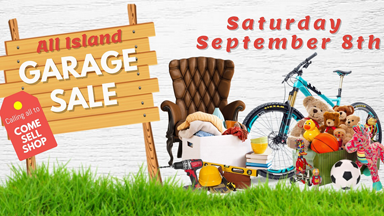 You can find a map of all the island garage sale locations the morning of September 8th at Fox Island Alliance Church on Island Boulevard, and also at the Fox Island Museum. Maps are $2 each, with proceeds going to support the Fox Island Citizens’ Patrol and the museum. An online map will also be available on the FICRA website, www.ficra.org. The Garage Sale is conducted on behalf of the FICRA Building Trust, a nonprofit 501(c)(3) tax exempt organization. The $15 and $25 site fees will help fund FICRA Trust’s Citizens’ Patrol. Fox Island residents will have the opportunity to display their goods either at their own home, the Nichols Community Center (NCC), or the Fox Island Museum on 9th Avenue. The museum will have food service. The last day to submit your application to participate in the Garage Sale this year is Thursday, September 6th. Contact Cheryl Nelson at lovedbytheking2011@yahoo.com or by phone at 360-430-7070 for questions about the NCC site or home sites. Contact Jane Schuelein at 253-549-2723 for questions about the museum site. Interested in hosting a garage sale at the event? Simply complete the official application form and pay online via PayPal. Remember, the last day to submit your application to participate in the Garage Sale this year is Thursday, September 6th. Enjoy the sale; hope you find some treasures! Doug Lawrence is a Fox Island resident and a licensed real estate broker with Keller Williams West Sound. Doug is an avid woodworker in his spare time, so you may see him poking around at the Fox Island Garage Sale looking for tools!